Today I am excited to share that we've launched a new service into beta called HERE XYZ. This includes an interactive designer, a command-line tool, and RESTful APIs available to use for managing and rendering geospatial data. Let me explain why these tools are so useful. I have geospatial data – points, lines, polygons, and metadata for places of interest to me or my app. I need to store this data someplace so that I can visualize it on a customized map and serve it. How do I do that? Provisioning a server from an Infrastructure as a Service provider. Installing a database, configure and tune it for geospatial related queries. Creating a service to process and query the data for visualization. Or, I can just use HERE XYZ and be done. As John Oram, XYZ Product Specialist put it – “Even better than owning a boat is having a friend that owns a boat.” It’s your data but HERE is introducing new tools to help you store, manage and render it on a map. You can start using these tools right now at no cost with a HERE developer account. Let’s say, I want to quickly create a simple map with just a few markers on it. HERE XYZ Studio is an interactive, visual, web-based application for uploading geospatial data, editing it, and visualizing it on a map. For quick one-off jobs this real-time feedback can be very useful to search for a few places by name, address, or coordinates and place a point or draw some geometry. Then you can publish or embed that map directly in your own website and go back to edit the content whenever you want. Let’s say, I have some geospatial data in a CSV, GeoJSON, or Shapefile with lots of markers and geometry. 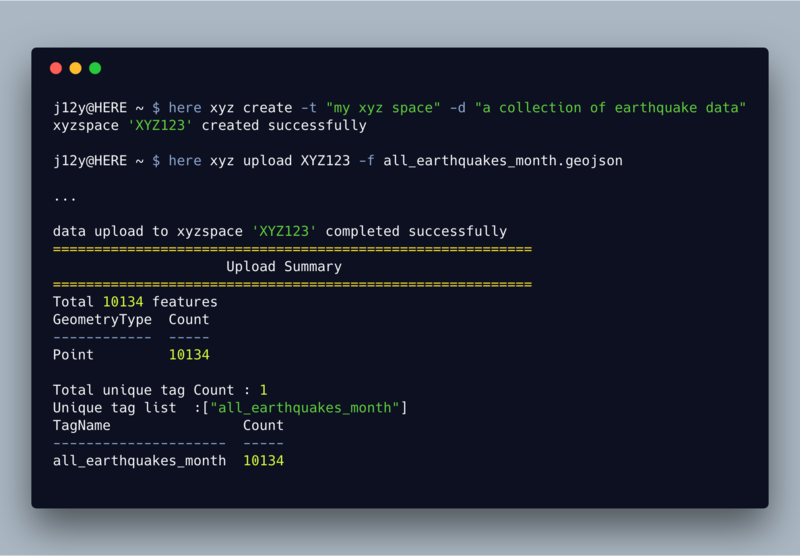 HERE XYZ Hub provides cloud services where I can call the REST API to upload, organize, tag, and query geospatial data. The HERE Command Line Interface (HERE CLI) further helps execute the API from a shell for even more precise control and script-ability than XYZ Studio UI provides. The REST interface also allows for generating tokens to help manage access rights for who (or what app) can read and write to data stored in your space on HERE XYZ Hub. Let’s say, I have some geospatial data but want to use a different renderer. Maps can be a personal expression of style, taste, and visual identity. Our applications demand this flexibility so it’s good to have options. By using the HERE XYZ Maps UI libraries and REST APIs I can integrate with many open third-party map renderers such as Leaflet, Tangram, three.js, or GeoJSON.tools to create a variety of maps to serve various purposes. 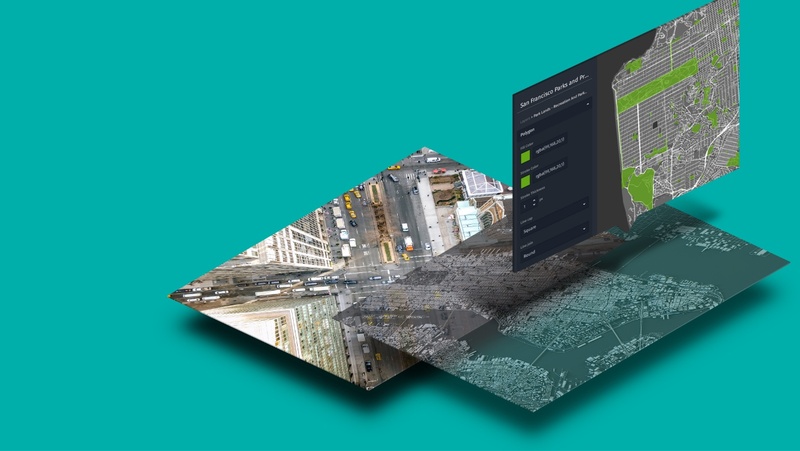 XYZ Studio solves real-world (literally) problems you would face dealing with large amounts of geospatial data and is now available for you to try and get started for free. Visit https://explore.xyz.here.com to learn more about the HERE XYZ tools. If you like any of the visuals you saw above, you should check-out the tutorials that demonstrate step-by-step how they were created. Now, with access to professional map data management and rendering tools like HERE XYZ I’m excited to see what maps you will make. We’re just getting started creating valuable tools for the community, so make a map and tell us what you think.